Love the yellow and pink together and I especially love the necklaces! my favorite color combo :) you look great! Those two colours look so cute together. Love it, Khatu! awesome colour combo! looking good! i love the colors together and your necklace! You are just TOO good at color blocking! I absolutely love your outfit! I like these colors on you. The peek of gingham is the best detail. i've been looking at that j.crew shirt for a while now. its the perfect all-season shirt!! looks perfect under the sweater. how does the shirt fit? looking fabulous as always - I love these colors together!! Great colors! It's so perfect for spring! 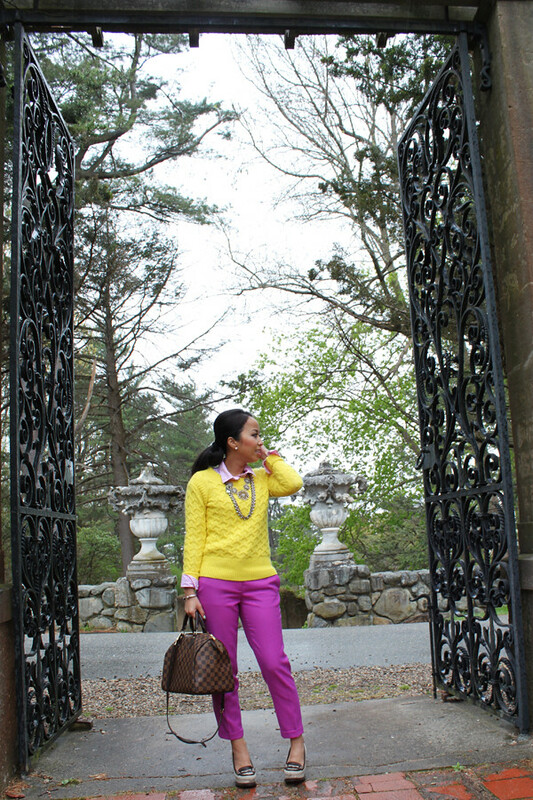 I just adore this fun, punchy colorblocking! same bag and pants! great minds think alike! cute sweater!!! love the outfit! Love the colors together...great look. ...you know how to do colors better than anybody else I read.